St. John the Baptist donated 51 Easter baskets to the St. Vincent de Paul Build a Basket for a Child in Need Campaign! St John the Baptist SVDP conference in Zachary put together 51 Easter baskets at their regular March monthly meeting to donate to the district effort. Sacred Heart confirmation candidates unite with St. Vincent de Paul members to serve our neighbors. The three candidates gathered food before making home visits. Each year our SVdP conference is blessed with the presence of our wonderful confirmation candidates who participate in Christ's call to serve one another. St. Benedict’s Church Conference in Napoleonville, LA on Wednesday, October 24, 2018. The SVDP Dining Room Director, Denise Terrence and her staff member Ms. Hilda delivered the delicious spaghetti lunch that was prepared by Ms. Ora Mae and joined Conference President, Lester Daggs and the Members of St. Benedict’s to serve 300 meals to the community. 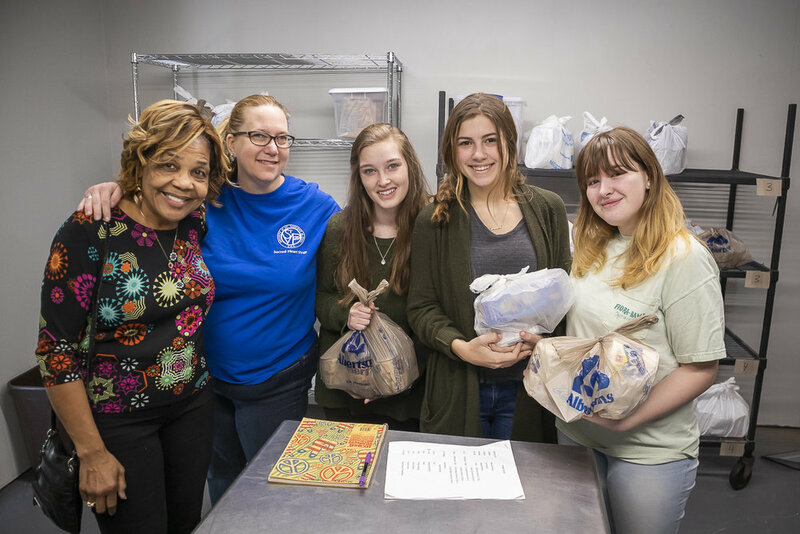 District Council President Kim Boudreaux, past District Council Crystal Chatelain and St. Patrick’s Conference Member, Christine Richardson were also on hand to help serve. St. Joseph School students help the St. Joseph Conference of SVDP, Ponchatoula prepare 108 thanksgiving boxes to be distributed to our neighbors in the area. 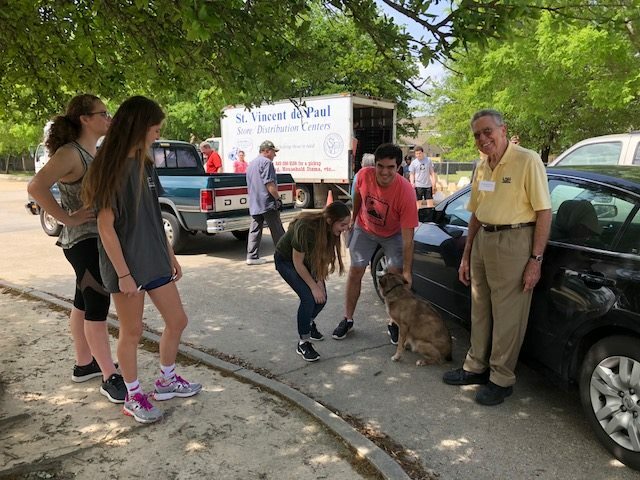 Thanks to everyone who supports this ministry, our parishioners, The Ancient Order of Hibernians and our KC Council, as well as our local Ponchatoula High School students who donated several thousand cans of food from there food drive. The Ancient Order of Hibernians donate 105 Bohnings gift cards for the SVDP Thanksgiving Baskets program. Thanks to the Hibernians for their support of SVDP and their dedication to helping our neighbors in need. L to R Dr Martin Kearney of AOH, Tony Guagliardo President of SVDP, Dcn Larry Melancon chairman of the Thanksgiving Baskets program. Thanks to all of our parishioners for your support. St. Joseph’s SVDP Conference in Ponchatoula, LA ! Grand Knight Buddy Pugh and KC member Pete Peterson present $500 to SVDP president Tony Guagliardo to assist in restocking the food pantry after a busy summer of helping our neighbors. Thanks to the KC's for always supporting the needs of St. Joseph Parish. On June 2, 2018, St Aloysius sponsored an event in the Valley Park area, which was affectionately named NeighborFest. 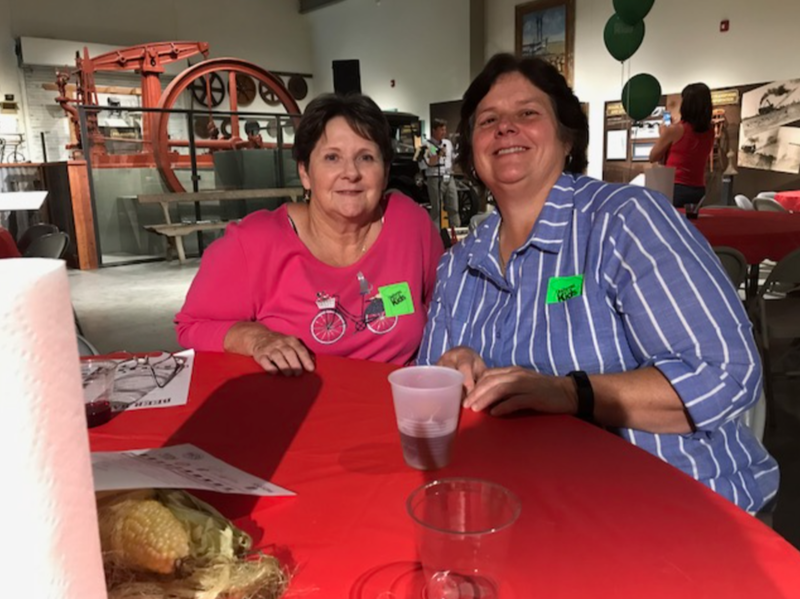 The event was the result of a shared desire by St Aloysius Parish and the Valley Park area to further interact with one another and learn more about the gifts of each community. Members of St. Aloysius Parish met with Mrs. Cynthia Owens-Green initially and learned of the history of Owens Grocery and Market on Balis Drive, which has been blessing the Valley Park community since 1938. The opportunity for recognizing the loving service that The Owens-Green family has provided to the Valley Park community through Owens Grocery for the past 80 years became simultaneously the wonderful focal point for St Aloysius and the Valley Park community to engage and celebrate together. In planning and preparing for NeighborFest, St Aloysius and the Valley Park community collaborated with the District Attorney’s Office, EBR Sheriff’s Office, Baton Rouge Police Department, EBR Fire Department, Owen’s Grocery, House of God Ministries, New Gideon Baptist Church, and New Morning Star Baptist Church. 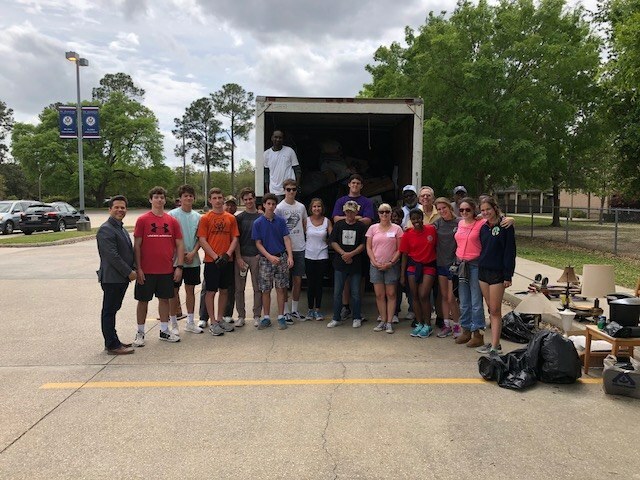 In addition, local businesses and organizations, and people such as Albertsons, Coca-Cola, Walmart, Diocese of Baton Rouge Racial Harmony Commission and Whitney Vann from Weekends with Whitney all showed their support by donation and/or participation. thanksgiving. Next, Ariel Green graced the gathered crowd with a moving and heart-felt liturgical dance. Erica Green King followed this beautiful movement with a soul-stirring hymn of praise. After this sharing of gifts, Rowdy Gaudet from the Mayor/President’s Office and Metro Council member, Barbara Freiburg, read to the gathered people a commendation by Mayor Sharon Weston-Broome for the 80 years of loving service that the Owens-Green family has provided to the Valley Park community through and beyond Owens Grocery. Prior to the reading of the commendation, Councilmember Freiburg commented that this kind of community event is something that should be happening every weekend in some neighborhood in our town. Ms. Cynthia Green’s face shone with humble gratitude as she listened to the commendation that traced the history of her family life-giving service through feeding families, caring for the homeless, praying, fellowship, and simply listening when someone needed an ear. The commendation also highlighted the historical collaboration of service between the Owens-Green family and St. Aloysius Parish in services such as providing Thanksgiving baskets, feeding families and the elderly, and providing shelter when needed. words, as she looked out upon the diverse crowd gathered in front of her, she graciously acknowledged unity by saying “this just shows that we can all get along.” As the ceremony concluded with Pastor Brandon Collins (New Morning Star Baptist Church) giving the blessing, the hungry crowd moved across the street to the tree-shaded lot where the festivities began. cookies baked by St. Aloysius parishioners. St. Vincent de Paul ministry handed out children’s books, prayer cards and friendship bracelets, while St. Aloysius parishioners, including youth, did face painting and assisted with games that were provided by BREC on the Geaux. Parish Fire Department’s fire truck as well as seeing and petting the Baton Rouge Police Officers’ remarkable horses. generous donation of bikes by Front Yard bikes afforded two bike-give-away drawings, giving away ten bikes, which made many children very happy! community seemed pre-ordained for the event, when she heard Paul Coreil read aloud to the volunteers setting up for the event Pope Francis’ intention for the month of June “that social networks may work towards that inclusiveness which respects others for their differences.” Kristy was struck by how the experience of NeighborFest affirmed that so many more blessings seem to be received than given when we interact with each other in this way. Cathy St. Pierre, social responsibility commission member, commented that this type of event so clearly reveals that we are all neighbors and children of God even though we come from different religious, economic and cultural backgrounds. The event was more than simply a great event celebrating 80 years of service by a dedicated family. It was indeed a celebration of what has occurred, what is occurring, and what can continue to occur in St. Aloysius, Valley Park, Baton Rouge, and indeed all communities in our nation and in our world: food, fun, service, inclusivity, diversity, and community. NeighborFest is a celebration that reminds us of where we are heading and what true service looks like - joyful, hopeful, responsible and communal. St. Jude's St. Vincent de Paul Conference! St. Jude's St. Vincent de Paul Conference served meals to the community on October 31st. Volunteers did a great job of working with St. Vincent de Paul Dining Room Director, Denise Terrance. Over 500 meals were served by our Loaves and Fishes Mobile Kitchen efforts. St. Vincent de Paul volunteers in the St. Jude area help so many of the needy! We provide so much to so many in need. Special thanks go out to all of our St. Jude volunteers! St. Benedict the Moor Volunteers Serve the poor! The St. Vincent de Paul Loaves and Fishes Mobile Effort gave out 283 meals in an hour! This was all made possible by the leadership of Conference President Lester Daggs, Special Works Board Officer Kevin Patterson, Father Ibeh and all of the wonderful parishioners of St. Benedict the Moor Parish. Council President Crystal Chatelain said, "It was awesome being in Napoleonville working with one of our Conferences serving the poor!" Again, 283 meals were served and those in need felt God's love through our St. Vincent de Paul Family. The Way of the Cross 2018! The Way of the Cross took place on Friday, March 30th, 2018. It was amazing to see people of all ages, nationalities, Faiths, and backgrounds walk together the Way of the Cross. The walk began at St. Joseph's Cathedral, located in downtown Baton Rouge, and traveled to the State Capital, then continued back to the Cathedral. As everyone stopped to visit each Station of the Cross, each station was correlated to the social injustices that affect our Neighbors in our Communities across the Diocese of Baton Rouge. Michael Acaldo, CEO SVDP Baton Rouge and member the St. Aloysius Conference, is pictured above reading the opening Prayer on the steps of St. Joseph's Cathedral. Kim Boudreaux, District Council Vice President and member of the St. Aloysius Conference, is pictured above reading the second station of the cross. Crystal Chatelain, District Council President and member of St. Patrick's Conference, is shown above reading the third station of the cross. Pictured above is a view of the Way of the Cross with the Capital in the background as the twelfth station is being read. Read this Beautiful Message from St. Aloysius Conference President Kim Bueche Hardman! FIVE FILLED TRUCKS from our St. Aloysius “SVdP Fill Up the Truck(S)!” Event! I am talking FILLED TRUCKS!!!!! How awesome is that??!? Such amazing generosity from our St. Aloysius Parishioners and the Baton Rouge Community! Thanks be to God! A special thanks to St. Aloysius for supporting and promoting this annual faith filled event and worthy cause. And, a very special thanks to Crystal Chatelain, SVDP District Council President (representing 23 Catholic Churches) as she sent the below beautiful message to us this past Saturday morning. 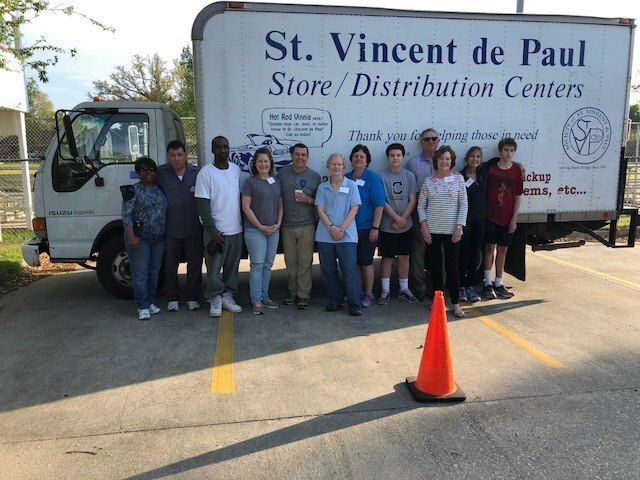 What a glorious and grace filled day was had by all on behalf of St. Vincent de Paul and in filling those trucks and in filling our precious neighbors’ needs. So many worked joyously and tirelessly…Vincentians, SVdP’s extraordinary staff and spirits (Lucille Cox, D’Andre, Quincy, Roy), CHS and SJA students (over 20 of them! )… we all came together in fellowship and fun…doing the Lord’s work! Everyone served with such zeal to keep everything moving perfectly truck after truck after truck after truck after truck! It was also remarkably heartfelt to see and feel firsthand the healing graces that came from the generosity and love of those who were passing on their loved ones belongings. The loving spirits of their loved ones live on in helping make better the lives of others in need. We thank them wholeheartedly. May they feel God’s healing graces and gratitude. The opening and ending prayer…as we held hands in a circle of love and prayer ( our youth…our future, SVdP staff, Vincentians)….. WOW! Holy and powerful as we gave thanks for the day, for one another and for our almighty and all powerful ever loving God for bringing us together in this beautiful ministry. God’s pure affirmation of all that is good. Thank you, Jesus, for teaching us the way, the truth and the life and for filling us with the Holy Spirit! We could feel it swirling in those strong winds all day long!!!!!!! AND, oh yes, indeed….we again had live entertainment! Stay tuned for pics and video of this awesome day….!!!!! And...one last thing…P.S. Mark your calendars….God willing….5th Annual…Palm Saturday, April 13!! !